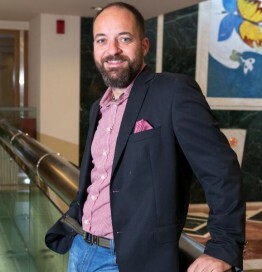 Mr. Stavros Habakis is one of the co-founders of m-hospitality. Mr. Habakis has worked in several consulting companies, including Delloite and PwC, focusing on the introduction of cutting edge ICT services and solutions in the public and private sector as well as a consultant for ICT strategy to Prime Minister’s Office. He is also a co-founder and managing director of H+S Technology Solutions sa, an IT company providing innovative solutions in the healthcare, retail and tourism verticals. Mr. Habakis has studied Chemical Engineering at National Technical University of Athens and holds an MSc. in Engineering Business Management from Warwick University.